Last summer I attended my first SoulCollage workshop at the C.G.Jung Association of Central Ohio. The method was developed by Seena Frost, a psychotherapist in California, and my workshop facilitators were certified by her. I found that I did not want to explore archetypes as suggested but preferred to just let my own deeper nature find and cut images from magazines and calendars, then put them together on the 5″x8″ cardboard in whatever way I felt drawn to do. It was easy to work on three or four cards at the same time, working intuitively instead of with an idea in mind. Then later I would use one of the recommended ways to interact with the completed card, beginning with the stem phrase “I am the One who…” Short poems emerged as intuitively as the small collages. 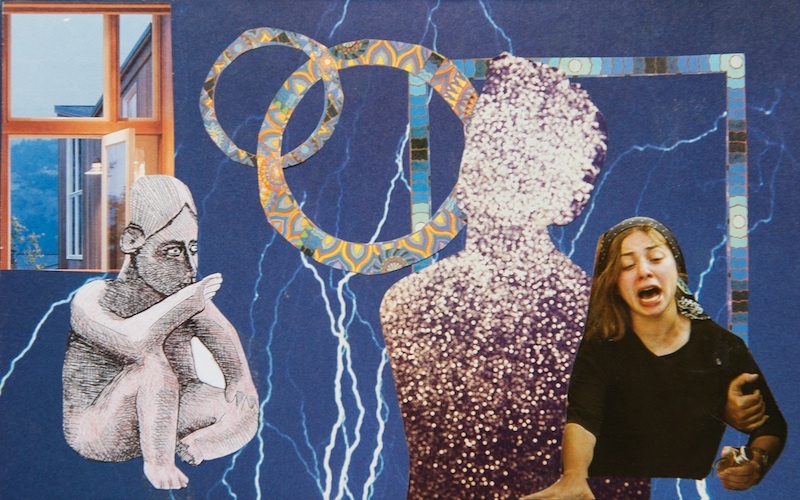 After making a dozen or so cards over a period of several weeks, it occurred to me to have an experience with an Ecstatic Posture and instead of writing about it, to create a collage instead to express what had happened. I loved it! The details of the sequential storyline were lost – “first this happened, and then I saw that…” – and instead I could convey the essence of the experience in an image. In the past I have taught posture workshops with Merry Norris, a former Cuyamungue Institute board member who is also an artist and has a welcoming studio with ample resources for creating images. 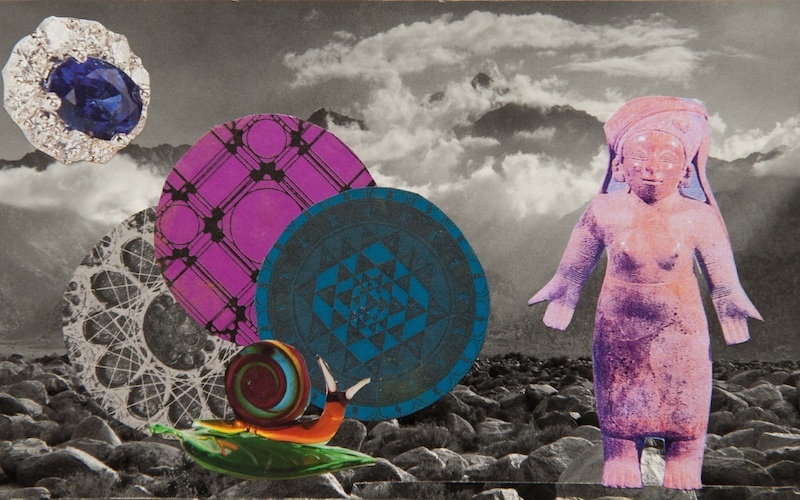 We decided to have a one-day workshop with a posture experience in the morning followed by time in the studio to create a collage, borrowing the 5″x8″ size from the SoulCollage work. Then we would have lunch and some time for rest and conversation, and do the same thing in the afternoon. After each creative session we would have a “gallery walk” to give everyone a chance to share our collages with each other. It was great! We have had two more Trance Card workshops since. Here are two of my cards, one with the Tala Diviner posture and the other with the Ecuadorian Woman posture. For the workshop I make reduced size copies of the postures from drawings from my books or photographs of the original artwork of the posture. That way we can cut and paste it into the collage. Some people just paste it to the back of the card if integrating the posture into the collage itself doesn’t seem right for them.It is easy enough to collect old calendars and magazines with photographs, or buy very inexpensive illustrated books at used bookstores. You can buy cardboard in 5″x8″ sizes as well as plastic sleeves to preserve the image, or you can cut the cardboard yourself. Glue sticks from craft stores and scissors are the only other equipment you need. Belinda Gore is the former vice-president then president of The Cuyamungue Institute, and currently serves as an advisor to the Board of Directors as well as Director of Training. For over twenty years, she was a close friend and colleague of Dr. Goodman. Belinda is the founder and co-director of the Enneagram Institute of Central Ohio and a leadership consultant and coach. The Artists & Spirit program is an opportunity to explore, expand, and document our ritual posture experience with sketching, painting, sculpting and other visual art mediums.